Mattel, the manufacturer of the iconic Barbie, in 2016, finally introduced a more diverse range of options for the doll. The new Barbie dolls now come in varied shapes, including tall, petite, and curvy, and also sport different hairstyles, eye colors, and skin tones. They are thus more reflective of the diversity of American females. After 56 years, this makeover was a welcome change. Research shows that 99% of 3- to 10-year-olds in the United States own at least one Barbie doll. She is the single most successful toy produced, according to The New York Times. In recent years Barbie had been criticized for promoting an unrealistic body image, being overly sexualized, and promoting gender stereotypes. To demonstrate this first point, in 2011 college student Galia Slayen made a life-size Barbie for National Eating Disorder Awareness Week. Extrapolating Barbie to life-size demonstrated her preposterous proportions: five feet nine inches tall with a 36-inch bust, 18-inch waist, and 33-inch hips. Not only does this represent a practically unattainable form, but she would be profoundly unhealthy. At this size, Barbie would lack the 17 to 22 percent body fat required to menstruate, a sign of malnourishment. Barbie does not cause eating disorders, but she may contribute to a cultural ideal that increases the risk for negative body image. 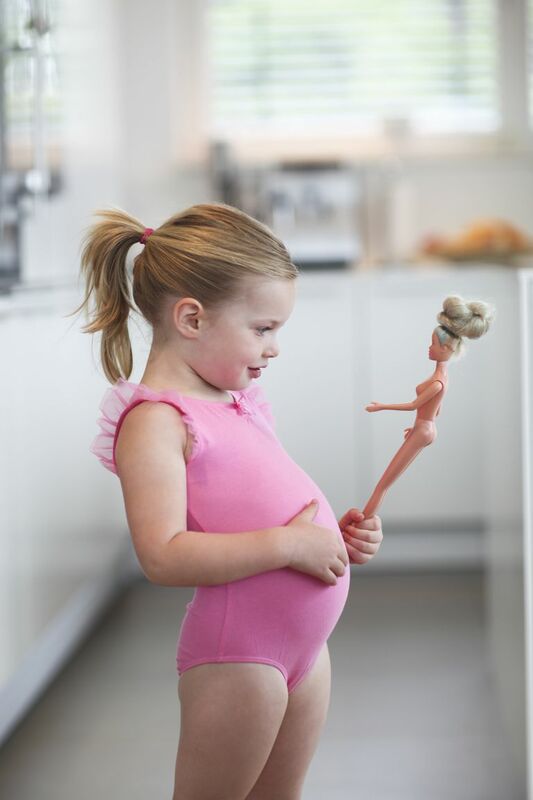 A study by Dittmar and colleagues exposed girls ages 5 to 8 to images of either Barbie dolls, plus-size Emme dolls (dolls inspired by the plus size model, Emme), or no dolls and then asked them to complete body image assessments. Girls exposed to Barbie reported lower body esteem and a greater desire for a thinner body shape than the girls in the other conditions. The authors concluded that exposure to the dolls may have a negative impact on body image. Negative body image has become increasingly common. Girls as young as five or six have been noted to express a desire to be thinner. Negative body image is a risk factor for several physical and emotional consequences including increased weight, depressive symptoms, and disordered eating, and can be a risk factor for an eating disorder. Weight stigma, negative attitudes about people in larger bodies, is also increasing and has been linked to negative psychological and health consequences. In a press release about the change, Evelyn Mazzocco, Senior Vice President and Global General Manager of Barbie said, "These new dolls represent a line that is more reflective of the world girls see around them – the variety in body type, skin tones and style allows girls to find a doll that speaks to them." The new Barbie is a step away from the white thin ideal that is dominant in our society. This is important. It shows children that bodies naturally come in a variety of shapes and colors. Of course, the doll options are still limited compared to the tremendous diversity that exists in the population. People want to see images (including dolls, models, and actors) who look like them, whether they are larger, older, darker-skinned, transgender, disabled, or anywhere else along other dimensions of body diversity. Thus, the new Barbie is a step in the right direction. It is important to see even greater body diversity in images, toys, and in the media. Then hopefully future generations will be able to liberate themselves from diet culture and the overvaluing of the thin ideal and be able to enjoy fuller lives. Dittmar, Helga, Emma Halliwell, and Suzanne Ive. 2006. “Does Barbie Make Girls Want to Be Thin? The Effect of Experimental Exposure to Images of Dolls on the Body Image of 5- to 8-Year-Old Girls.” Developmental Psychology 42 (2): 283–92. https://doi.org/10.1037/0012-1649.42.2.283. Hayes, Sharon, and Stacey Tantleff-Dunn. 2010. “Am I Too Fat to Be a Princess? Examining the Effects of Popular Children’s Media on Young Girls’ Body Image.” The British Journal of Developmental Psychology 28 (Pt 2): 413–26. Common Sense Media, “Children, Teens, Media, and Body Image.” January, 2015. https://www.commonsensemedia.org/research/children-teens-media-and-body-image. How Does the Media Effect Body Image in Teens?